BARCELONA, Spain – Yes, what you’re looking at here is the latest Toyota RAV4 (that’s “Recreational Activity Vehicle” for those who aren’t aware of the unusual name’s origins). 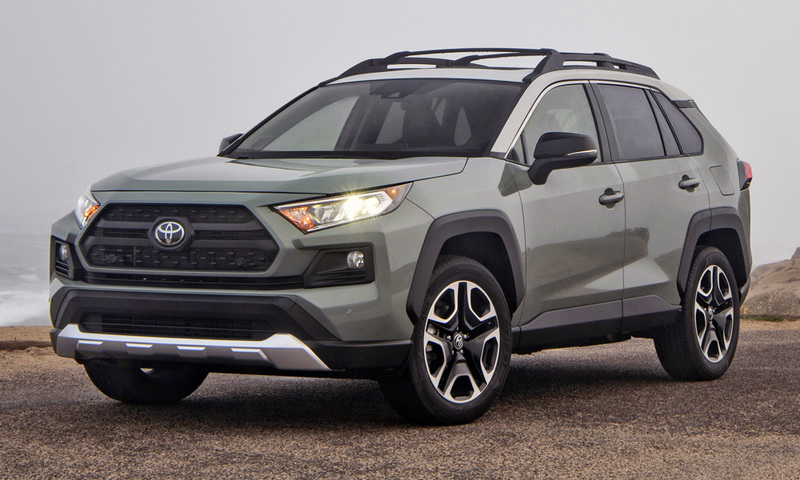 As is customary, the next generation of any vehicle is generally larger than its predecessor … but, in the case of the fifth iteration of Toyota’s popular crossover, it’s both larger and smaller. Confused? Let me explain. What the designers have done is reduce the overall length (by some 10 mm) and the height (by 5 mm), but increase the wheelbase (by a full 30 mm) and the width (by 10 mm). As a result, the front and rear overhangs are shorter. In addition, Toyota claims it has managed to increase the ground clearance by 15 mm. The extended wheelbase is particularly noticeable when sitting in the rear quarters, where improved legroom is enjoyed. Interestingly, the fuel tank has shed five litres (possibly as a result of that extra ground clearance) and now holds 55 litres. Still, this should not be too much of an inconvenience with the anticipated improved fuel economy of the two petrol engines that will be offered at the local launch in March 2019. Styling, though, is quite radically changed from that of the previous generation. This time, the majority of lines are sharp and the squared-off wheel arches lend the chiselled new RAV4 a far more “macho” look than that worn by its forebear. Indeed, the fresh face features an angry “Darth Vader” snarl, while the GX-R derivative we’re evaluating here boasts further cosmetic enhancements to the front appearance, with a broader grille, larger skidplates and more aggressively shaped wheel arches setting it apart. Some may prefer the softer presence of its predecessor, but this latest look does lend credence to the instructions of Toyota boss Akio Toyoda, who has made it clear he wants “no more boring cars”. Visibility has been enhanced by increasing the glass area all round (particularly in the case of the smaller quarter-light panes, front and rear), while the interior has also moved up a level in terms of quality, with a large touchscreen, redesigned gear lever and console area, and rotary knobs that feature a ribbed rubber coating adding appeal. Satellite navigation will not be included in any of the SA-spec models since Toyota believes most buyers prefer smartphone systems. Interestingly, the top-spec model’s rear-view mirror doubles as a screen fed by a rear-facing camera, although this can be switched to a conventional mirror with the flick of a lever. Seating space is generous and (again thanks to the added length between the axles) the boot is also larger. Although the European units at the launch had no spare wheels, four of the five derivatives that will make up the South African line-up will come with a full-size alloy spare as standard. Only the top-spec VX version will make do with a temporary spare, ostensibly thanks to its standard 19-inch items (interestingly, though, this sees the VX boast an increased luggage capacity of 572 litres as opposed to the 492 litres offered by the other variants). Unfortunately for diesel-lovers, no oil-burning engines are on the cards for the new RAV4. Instead, the naturally aspirated 2,0-litre petrol engine is back with a few extra horses. Thanks to some under-bonnet massaging, the four-cylinder unit’s outputs are now 127 kW and 207 N.m. In the entry-level GX model, drive is sent to the front wheels, via either a six-speed manual gearbox or a continuously variable transmission (CVT). The GX-R variant, however, boasts all-wheel drive. While the 2,0-litre’s power output seems fairly high on paper (for a free-breathing unit, at least), the engine needs to be revved if decent forward progress is desired and there’s not quite enough low-down torque to compete with the many smaller-engined rivals that use turbocharging. While this may make the RAV4’s powertrain seem a little old-fashioned, it’s worth noting that older engines will more than likely be more reliable than their downsized forced-induction siblings, something of which Toyota is always very conscious (the firm wouldn’t want its reputation for mechanical dependability to be dented, after all). Fuel consumption claims are significantly lower than those of the previous generation, with the 2,0-litre AWD CVT boasting a combined figure of 6,7 L/100 km. The electrically assisted power steering system now has the motor positioned directly on the rack instead of further up the steering column, improving the steering feel to something close to that of hydraulic assistance. The vehicles that we drove used the powertrain of the GX-R but without the styling features we will see when the right-hand-drive units arrive in South Africa (note that the images you see here show the added aesthetic elements). The CVT gearbox does have some slip, but the steps make it feel more conventional and there is the addition of paddle shifters for those seeking a sportier edge. On a very twisty mountain pass near Barcelona, switching to the paddles enhanced the driving experience by allowing me to easily select the appropriate ratio for the differing corner speeds, while adding some engine braking before negotiating slower, tighter bends. That said, the eight artificial steps are too many; six would have done nicely. In these days of “more is better”, the number of virtual gears seems to have become a sales strategy, even if they’re there to merely mimic a conventional ‘box. Still, a distinct advantage of coupling a CVT with all-wheel drive is that a “low range” is naturally present to assist with climbing steep hills. The suspension set-up is spot-on, with enough compliance to soak up most bumps while still limiting body roll through fast corners. Apart from the freeway and mountain passes, we also traversed an off-road course that was quite entertaining (by overseas off-road standards). The roads were muddy and slippery but the intelligent permanent all-wheel-drive system coped without any fuss. The larger engine fitted to the top-spec VX displaces 2,5 litres, and its peak outputs have been hiked to 132 kW and 250 N.m. The only gearbox offered here is an eight-speed conventional torque-converter automatic transmission. The majority of the units on the launch in Spain employed Toyota’s latest hybrid system (incorporating this 2,5-litre engine), but these powertrains are apparently not suited to high-altitude operation so will not be sold in South Africa. Standard features on base GX models will include LED headlamps and daytime running lights, front and rear foglamps, cloth upholstery, stability control, trailer sway control, seven airbags, manual air-conditioning, a rear-view monitor, a seven-inch touchscreen system (with one USB port), steering wheel controls and cruise control. The GX-R all-wheel-drive model, meanwhile, adds leather treatment for the seats and steering wheel, hill-descent control, push-button start, automatic air-con, an electrically adjustable driver’s seat, seat heating up front, three USB ports and a wireless phone charger. The flagship VX derivative, meanwhile, gains pre-crash braking and lane-departure alerts with adaptive cruise control, an electro-chromatic rear-view mirror and driver’s seat memory settings. In addition, Android Auto and Apple CarPlay seem likely to be offered later.